Whether it's a housing development or a shopping mall, new construction brings lots of buzz and excitement to a community. Once complete you'll want the entire experience to reflect the care and thought that went into planning and construction. Let Outdoor Designs help you be pulled together and polished with custom entrance monuments, street signage, mailboxes and lot markers. 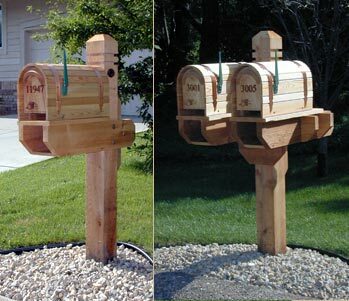 Stettler Single and Twin posts with cedar Tambour mailboxes and brass accents.